Excerpt from the Introduction to Radical Beauty: A Shift In Your Personal Reality, by Deepak Chopra and Kimberly Snyder. This book is available for sale at Avalon. The word beauty is in need of a new definition. In many ways we’re obsessed by it. As you move through your daily life, you inevitably encounter the word beauty. If you glance up while shopping at your local pharmacy, you’ll find numerous aisles stocked with products claiming to make you more beautiful. There are countless magazines and websites dedicated to beauty, teaching us different ways to lose weight, choose the perfect lipstick, create smoky celebrity eyes, and copy the latest hairstyle trends. If you stop and look around at our culture, the concept of beauty seems very important. But what exactly is beauty, and when you think of the word, what does it mean to you?The specifics of what is considered beautiful may shift as one fad fades in favor of another, but one thing remains constant: our fascination with beauty. People have appreciated beauty and grasped for it for centuries, beginning with the earliest human civilizations. Ancient Egyptians and Babylonians used primitive forms of kohl eyeliners to dramatize their eyes. In ancient Greece women applied rouge made from crushed mulberries to brighten their cheeks. Images of porcelain-skinned, sleek-haired women have been discovered painted onto centuries-old Asian rice-paper scrolls. While the shape and size of idealized features vary between cultures, there tend to be a few commonly held beliefs about beauty. First, there is the idea that beauty is a limited and fleeting commodity, as if being beautiful is reserved only for the young and a small, genetically gifted portion of the population. Another widely held conviction in many cultures is that beauty is a relative phenomenon, meaning that it is measured by comparison against others. One woman’s hair or eyes are beautiful only if they are more beautiful than another woman’s. This idea perpetuates the unfortunate and unnecessary rivalry that is still far too common among women. In the twenty-first century we all need a new concept of what real beauty is. For both authors, it’s something we like to call Radical Beauty. What does that mean? Radical Beauty has nothing to do with trendy makeup, fleeting fads, or insecure comparisons with other women. Radical Beauty extends beyond the physical, encompassing all parts of your inner and outer being. It is something that exists universally, and, at the same time, it is completely unique to you. It nurtures and highlights your magnetism and confidence, vitality, and overall health, from your bodily tissues to the outer, visible parts of yourself. You achieve Radical Beauty when you reach the highest and most authentic potential of your natural true beauty. This means that Radical Beauty is a birthright for each and every one of us. Certain makeup and hair and skin products are fantastic for temporarily defining your eyes or smoothing out your skin, but there is so much more you can do to augment your inherent natural beauty. That is what Radical Beauty is all about. Instead of being shallow or limited to external body parts, Radical Beauty goes deep below the surface. For some women, it will be a brand-new concept to think of beauty as more than the shape of their face, the size of their body, and the color of their hair and skin, but look around in nature. What do you see? Beauty and harmony are universal forces that manifest everywhere. A graceful willow tree and a mighty oak are both beautiful in their own way. Nature is infinitely generous with the variety of beauty that exists, and this holds true for human beings, too. In the natural scheme, every creature has its own pure and unique beauty. Hold a single rose petal in your hand and you will realize that beauty isn’t relegated to spectacular waterfalls and dramatic sunsets. You can discover a marvelous harmony in the most common things: cutting open a grapefruit, looking at the mottled pattern on a rock, or examining the interconnected, vein-like inner structure of a houseplant’s leaves. Beauty truly exists in every single expression of nature once we allow ourselves to see it. Your uniqueness makes it totally unnecessary to compare yourself with any- one else. For too many people, beauty involves feeling inferior by comparison. This always creates a gap, a duality between what is now and what is the ideal. When it comes to Radical Beauty, there is absolutely no space for comparison or competition. Each of us is here to express our highest beauty, which no one else’s beauty can diminish. But you can add to another person’s beauty– your mother’s, your daughter’s, your friend’s–by making this an aspect of your own beauty. You are free to fully celebrate others’ beauty while feeling confident in your own. What a change that would be! We’ve begun with an inspiring vision. Next come the practicalities, the howto that makes any vision come to life. 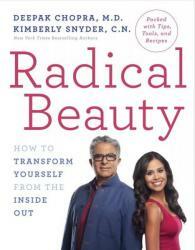 You can achieve Radical Beauty by following the six Radical Beauty Pillars, which make up the firm foundation of powerful lifestyle teachings that support your highest expression of beauty. A series of practical guidelines, rhythms, and routines not only will benefit you but also will promote beauty and health for the whole planet. In Ayurveda, the traditional medical system of India, there’s a saying about how everything in nature works together in harmony: “As is the macrocosm, so is the microcosm. As is the great, so is the small.” A healthy body is meant to be part of a healthy planet. What’s truly good for one is naturally good for the other. Our pillars restore this natural harmony. Just as pollution, chemical tampering, and toxic dumping disrupt harmonies in nature, your beauty becomes diminished from congestion and toxicity buildup in your digestive system when you eat the wrong foods, use toxic beauty products, and inhabit improper sleep and lifestyle routines. Beauty has to emerge from the inside out, so your dietary choices and digestion are a primary influence. The way that you eat is a critical factor in determining the vitality of your beauty. Everything you put into your body is used to create the foundation upon which your body, hair, and skin are built. In this pillar you’ll learn dietary shifts that will optimize your digestion, create nutritional balance, and bolster your nutrient absorption. This will result in a clearer, smoother, and more radiant complexion, a flatter midsection, more natural muscle tone throughout your body, higher sustained energy, and–over time–healthier and more lustrous hair. This pillar will identify the most effective ingredients to apply directly to your skin, as well as the most beneficial Radical Beauty skin-care routines. These will ensure that you nourish your skin in the best way possible, while avoiding toxins that can tax your skin and migrate to your inner body, polluting your blood- stream and liver and contributing to toxic congestion. When done properly, simple daily routines, such as abhyanga oil massage (which you will find out how to do in Pillar 2, page 121), can soothe your nervous system and create powerfully rejuvenating effects, including a reduction in the pent-up stress that contributes to wrinkles. Such routines can help your organs actually grow younger and help restore the vitality and glow to your skin. The powerful shifts in this pillar also promote detoxification by manually sup- porting your lymphatic system from the outside in. Your sleep rhythms are an essential component of Radical Beauty, and this pillar will outline numerous tips and tools to enhance this important part of your life. Proper sleep enables your blood to flow more efficiently to your skin, which is important for supporting your skin to heal itself daily. It also helps reduce dark under-eye circles and stress. Reduced stress can help improve eating habits and digestion, which in turn can lead to even clearer skin with fewer breakouts. You will also learn optimal sleep methods to enhance your body’s creation of growth hormone, which boosts your collagen production and is critical for keeping your skin firm and resilient. This pillar focuses on how to live closer and more in tune with nature, which is a powerful way to bring out your natural beauty. You will learn how to align your energy with the larger natural rhythms of nature by shifting your daily patterns in accordance with the solar and lunar cycles and the seasons. This alignment with the macrocosm will help you harness the force to support your overall energy and vitality. You will also learn how to reduce the toxic chemicals, electromagnetic radiation, and pollution in your personal space, which will reduce their negative impacts on your hormones and biorhythms. This pillar also teaches the benefits of simple practices like “earthing,” or physically touching the earth’s surface, which have been shown to help balance your body with negative ions and help neutralize aging free radicals. This pillar will delve into the best ways to move your body to promote natural grace, tone, and beauty, as well as which forms of movement are aging and should be avoided. You can actually overdo certain types of workouts–excessive levels of physical exertion can create oxidative stress in your body. When it comes to movement, balance–not total hours spent at the gym–is the key to getting the most tangible, visible results for a toned, fit body. You’ll learn powerful breathing techniques that can make a tremendous difference to your beauty, as well as specific yoga poses, appropriate for all levels, to promote vitality and detoxification. Such movements can promote inner healing and rejuvenate everything from your digestion and circulation to your skin and hair health. This pillar is all about how self-love, heart-based living, and a peaceful mind foster natural beauty from the inside out and increase your natural glow and magnetic presence. Chronic anger, worry, and fear are as acidic and inflammatory to your body as refined junk food. To avoid toxicity from negative emotions, the practice of meditation is perhaps the most powerful step you can take. When you meditate, you reach the prime source of beauty. We can call it spirit, the soul, or the true self; the exact word isn’t important. What’s important is to have the inner experience of being connected to your source, and then integrating meditation into your life. Spiritual beauty brings another dimension to who you are and what your purpose is. Nothing is more beautiful than being able to live as a whole person, someone who shines with an inner light. Then the true union of body, mind, and soul is complete. All of the pillars work together to round out the Radical Beauty lifestyle that will allow you to express your highest and most authentic beauty. Reposted with kind permission of New Leaf Distributing’s Evolve Magazine. Evolve is a free magazine, available at Avalon.